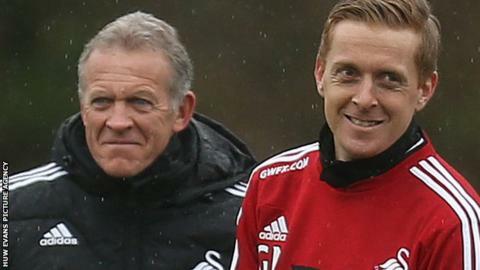 Swansea City caretaker boss Alan Curtis says players and staff feel they let down former manager Garry Monk. Monk, 36, departed on Wednesday following a run of one win in 11 Premier League matches. First-team coach Curtis, 61, will take charge for Saturday's game at third-placed Manchester City. "We all feel, staff and players, that we have let him down and we want to go a small way to rectifying that on Saturday," he said. "Some may say it's too late because Garry's already gone, but we also have a massive duty and responsibility to the club and our supporters. "We need every point we can get and we will strive to be competitive and get something out of a difficult game." Swansea are one point above the relegation zone following Saturday's 3-0 home defeat by Leicester City. Monk had been with Swansea for more than 11 years, first as a defender and as manager since February 2014, when he replaced Michael Laudrup. Curtis, who had three spells with the Swans as a player, said it had "been a difficult few days for everyone" at the club. "We are all used to managers leaving because sadly that has always been part of the game," Curtis told the club's website. "But Garry's departure seemed a lot more personal to everyone because he has been at the club so long, together with [former coach] Kristian O'Leary. Former Wales and Manchester United star Mickey Thomas believes Ryan Giggs would be interested in succeeding Monk. Ex-Wales captain Giggs, 42, is among those who have been suggested as possible successors to Monk. Cardiff-born Giggs became United's assistant manager when Louis van Gaal took over in May, 2014. Van Gaal said he was was unaware of any approach by Swansea chairman Huw Jenkins, but Thomas said the vacancy could be attractive to "ambitious" Giggs. "If Swansea were there for the offering, I'm sure as a man I know well, he would consider it," said Thomas. "It would be a big decision to leave, but if it's not the opportunity to be a manager at Manchester United then he would look elsewhere, I'm sure. "He's ambitious, was a magnificent player and had a great career and I'm sure he will want to be a success as a manager."